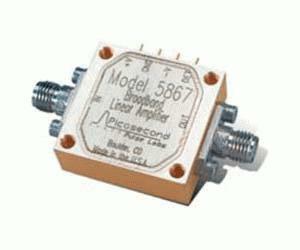 The Picosecond Pulse Labs Model 5867 is a broadband linear amplifier intended for use amplifying signals with a minimum amount of distortion. The 5867 demonstrates exceptional gain flatness and low deviation from linear phase while providing a bandwidth of 10 kHz to 15 GHz. This amplifier is ideal for use as a linear gain block in applications such as 12.5 Gb/s fiber optic receiver channels.